Take 10 g of curry leaves and boil in 100 ml coconut oil, till the leaves turn black. Massage hair with this oil, twice a week, to promote hair growth and retard the greying process. Grind a few curry leaves and mix with either curd or buttermilk and regularly to prevent premature greying. Grind a handful of curry leaves and mix with fresh coconut milk. Apply mixture all over the scalp, once a week, to nourish hair roots. Grind one cucumber, half a beet and one carrot in a mixture or juicer and drink it. This cures dehydration, acidity and promotes hair growth. It is the best astringent for your face. Daily application prevents pimples and blackheads. Besides, being a cooling agent, it also helps lighten blemishes. Carrot juice helps purify the blood, improves vision and keeps skin looking healthy. When taken regularly it also prevents constipation. Grate onions and extract carrot juice. Mix in some honey and apply on dry skin. In case of oily skin just add a few drops of lime to carrot juice. It helps reduces pimples. Soak 8-9 almonds overnight. Next morning grind into a fine paste, mix with curd and a few drops of lime and apply all over face and neck. This will help brighten and soften skin, reduce blemishes, prevent blackheads and pimples and delay the appearance of wrinkles. Mix a teaspoon of almond paste with grated cucumber and a teaspoon of grated raw potato. Make a compress of this mixture and place over eyes for 10 minutes everyday. Mix a teaspoon of almond oil with a teaspoon of castor oil and coconut milk and two teaspoons of neem juice. Massage this mixture gently on the scalp for 10 minutes. 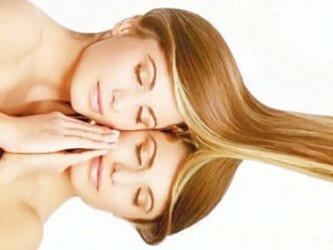 This will prevent hair fall and dandruff. 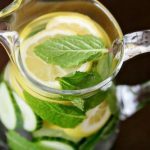 Brew a big cup of peppermint or mint tea and cool it. Wash and condition hair as usual and then rinse with the tea. Again rinse off with water. This will make greasy hair look full and shiny. 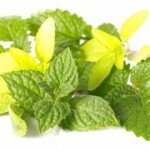 Mint leaves when ground into a paste and applied on face reduce the appearance of pimples and also make the skin cool. 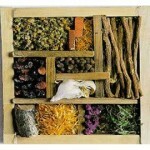 So you are weary and tired and none of those cosmetics seem to be doing anything to make you look and feel fresh? Fret not! Follow these golden rules and get beautiful…naturally. Begin your day with a warm glass of honey-water. Just shake a teaspoon of honey in warm water and lap it up. 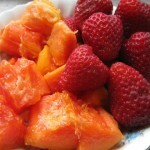 Have plenty of fruits for breakfast and salads for lunch and dinner. A cupful of curd daily is good for skin and hair. Don’t use harsh soaps for your skin. 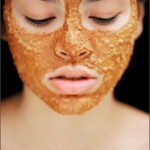 To make your skin glow, make a paste of gram flour, cream and turmeric powder and rub all over the body before a bath. Your skin will be visibly glowing and soft. 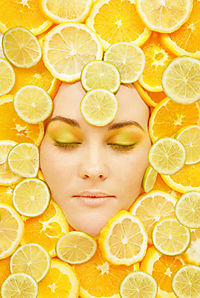 Use lemon or cucumber juice as an astringent. Papaya pulp can really rejuvenate your face. To get rid of stubborn acne and blackheads, wash and clean coriander leaves well. Grind into a fine paste. Apply all over face twice a day. Apply rose water cubes on your face to feel fresh instantly. For dandruff, mix equal quantities of buttermilk and coconut oil and apply on the scalp. Rinse off after 30 minutes. Do this every 8 days to keep your hair clean and bouncy. Drink at least six glasses of water everyday. It will enhance your complexion greatly. You are what you eat, so avoid excessively oily and spicy food. Exercise daily for about 20 minutes. It will keep you fit. Smile! It increases your face value and helps to relieve stress and tension. Besides you never know… someone could be admiring you!